On the last weekend of May,we were invited to the Holiday Creativity with Canon Pixma workshop by Omy and Canon. We had been selected as one of the 10 appointed Creative 'Craft Guru ' < cough><cough> to showcase our take on creativity. Before we attempt to mesmorize you with our craft, we decided it is best to pick a few tips from the gurus first. After all we are just 2 and 6 , so any pointers in the creativity department is very much welcome. The workshop was held at Sheraton Hotel ballroom. It is essentially a parent and child workshop for kids age 5-12. Hosted by the ever bubbly host-actress-blogger Joanne-Maria Sim and celebrity blogger Silver Ang, this workshop promises an afternoon of fun and discoveries on what you can do with the Canon Pixma Printers. For today , we have 3 travel related projects to undertake. Before that, here is a quick look of the printers available. There are a mix of old and new printers on display. The top of the line Pixma MG6370 and MG 5470 are popular due to its wifi capabilities. The printers are used to print photographs for use as part of our craft session. The output of the photos are of top notch standards, similar to what you can get in a normal photo processing shop. The most important feature is perhaps the ease of use. Within a few prints, I managed to master how to print a photo from one of the camera. 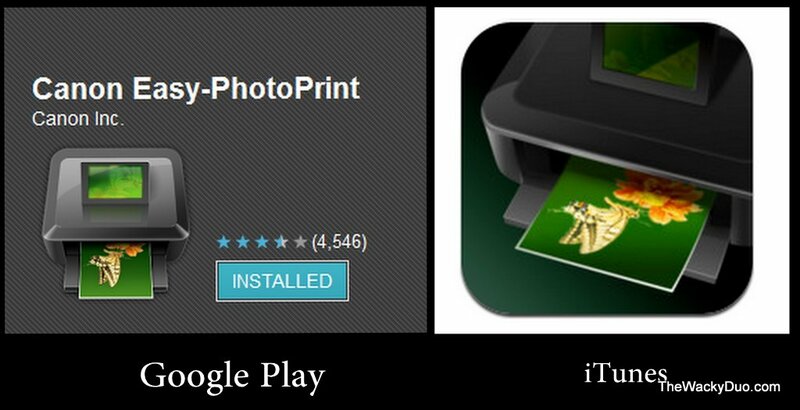 The process is even easier if you have an Android of IOS , simply install the Canon Easy Print (iTunes / GooglePlay )and you can print via the phone. Printing wirelessly is also possible for wifi enabled cameras in the latest version of wireless Pixma printers. The workshop may be for ages 5-12, but we managed to snag a seat for Didi to join in the fun as he loves his arts and craft. We are provided with some papers printed from the Canon Pixma printers as well as arts materials like glue, double side tape and scissors. For today we will be attempting to make our own passport holders, luggage tag and postcards. First up is the passport holder. We used 2 pieces of coloured paper to form the front and back of the passport holders. After we place the papers together, we cut a small hole on the shorter side to make a hole. We extend a string through the hole and place a button on the other end to secure the passport holder. Thereafter we made an inside pocket with another piece of paper cut to fit 3/4 of the size of one side of the passport holder. Double side tape it and voila , you have passport holder. The next part is probably the fun part, we decorated the passport with our choice of photos and decorative artworks provided. I even made myself a 3D name tag to paste on the front. Ta-at! The passport holder is complete. Didi has his version done with assistant from Mommy. We reckoned these passport holders are the best in the market as they are unique one of a kind holders. They are probably priceless as well given its limited production of 1. Next up is the luggage tag. For this you would require a plastic name card tag as well as one piece of paper big enough to fit round the name card. A ribbon is required as week to complete the look. Honestly we were a little lost on the instructions given by the hostess as there are no visual cues. Perhaps a live video feel on what they are doing would be helpful. Nevertheless since the workshop is about creativity, we decided to innovate and let our creativity kick into overdrive. Within a few nip and tucks, we made ourselves 2 decent luggage tags. Our workshop timings got into overtime and the postcard session was reduced. Nevertheless we did complete one 3 D postcard within 5 minutes. As with most arts and craft session, there is a mini mountain of mess to clear up. The effort was worth is as we are please with our creations. Arts and craft session need not be the normal drawing and painting in the future as we discovered new ways to utilize the Pixma printer. To top it off, we get to cart away with a Canon Pixma MG 5470 for our use as the official 'Craft Guru' ( we love the title!). Look out for our upcoming posts as we attempt to showcase our talents with a few creations on the Canon Pixma printer.